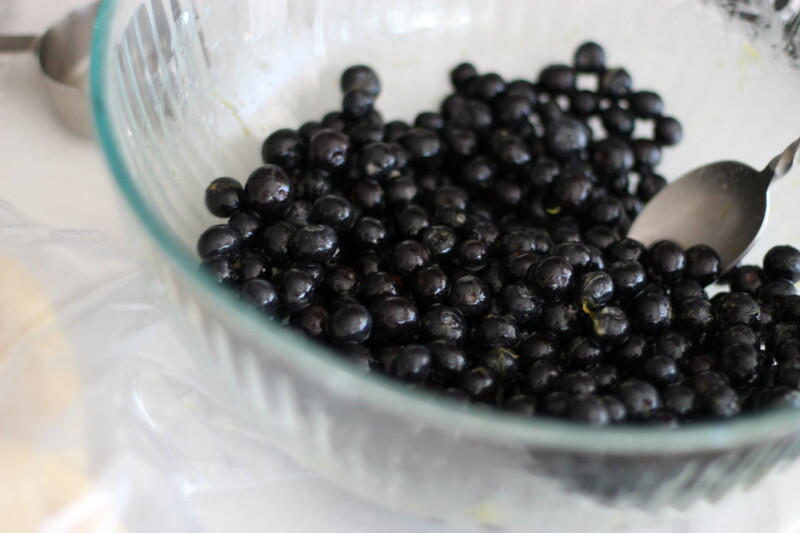 A couple of weeks before moving day last month I bought baskets of blueberries (’tis the season!) 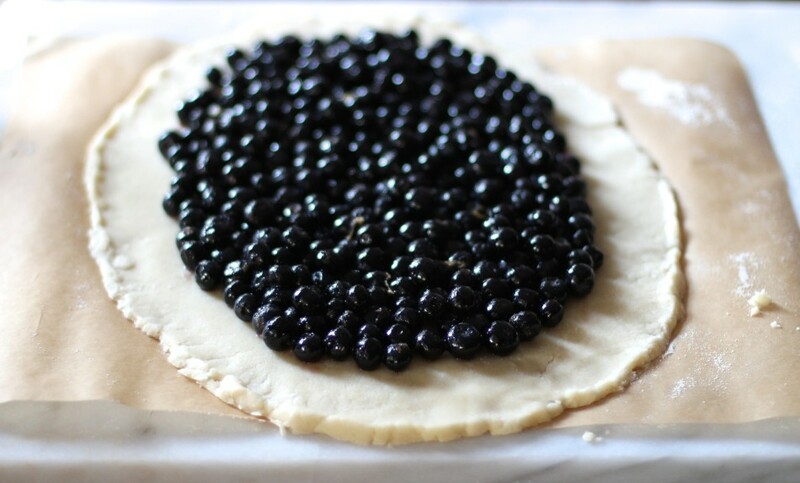 to make a galette for Friday night dessert after an exhausting week of packing. I’m happy to finally (!) share this because I think you will love it. Every sweet blueberry bite of it. As beautiful as it was coming out of the oven bubbling summer goodness, I decided we needed to a la mode this big beautiful hunk of fruit dessert. why the heck not? It’s summer. Let’s bring out the ice cream. Snickerdoodle ice cream. Have you seen the new cashew based flavors So Delicious? The folks at So Delicious were kind enough to send me the new flavors to try and what a treat they were. I became a little obsessed with the snickerdoodle flavor. They got the flavor right on and the cashew base makes it oh so creamy. You guys, this cinnamon sugar cookie snickerdoodle flavor is dairy, gluten, soy and egg free. 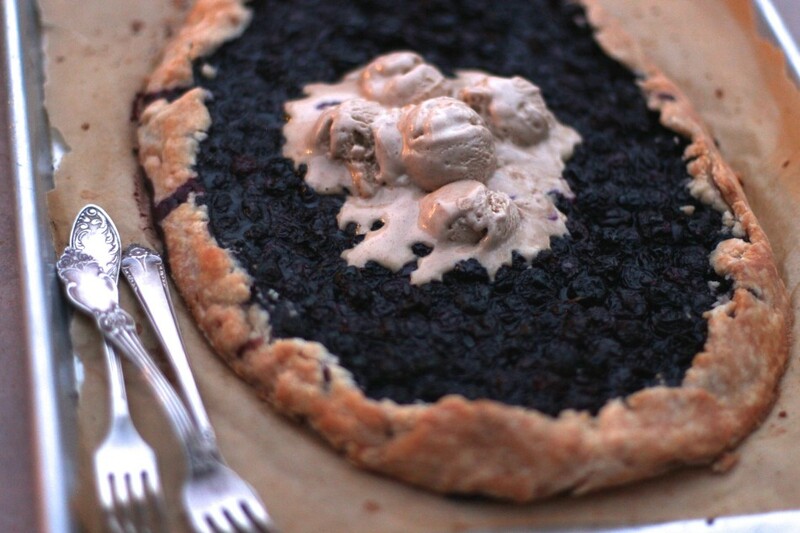 It tastes similar to snickerdoodle cookies dunked in milk and the perfect addition to this blueberry galette on a summer night. Phew. Got this photo in before the sun went down. Some may say vanilla ice cream is the classic a la mode flavor – forget it, go for the snickerdoodle. The cinnamon/blueberry combo is too good to pass up. By the way, their new cashew flavors are all GF, DF, SF, and Vegan. I found them to be creamier than the coconut based flavors they make. If you haven’t tried them yet you must. They have a salted caramel cluster flavor for you salty/sweet lovers (myself included) that I scooped (softened so that it can easily be sandwiched) between my chocolate chip cookies and then wrapped in wax paper and froze it for an hour. THAT is one ice cream cookie sandwich you need to try. Funny enough, a week after we devoured this luscious dessert I received the July issue of Bon Appetit with a big blueberry galette on the cover! This is more “free form” and forgiving than pie is, so have fun with it. I pulled out dough I had prepared and froze in May (would have never remembered if I didn’t date my freezer bags!) and let it thaw overnight in the fridge. Then rolled out the dough on the floured parchment paper to transfer (along with the paper) onto the baking sheet. Note: If you try to lift it off the paper it will fall apart. Gluten free will do that to ya. Then crimp the dough. If sections of dough begin to break (chilled dough is harder to work with than room temperature) you can either: overlap dough to patch up the cracks, or wait 15-30 minutes until the dough softens then crimp and chill the galette for 30 minutes before baking. I crimped the chilled dough and patched a few spots, then brushed my wash over with a little extra on the patched areas to push the dough together. Works like a charm, fortunately. I dread the chilling-warming-then-chilling-steps that inevitably comes with gluten free pie dough. 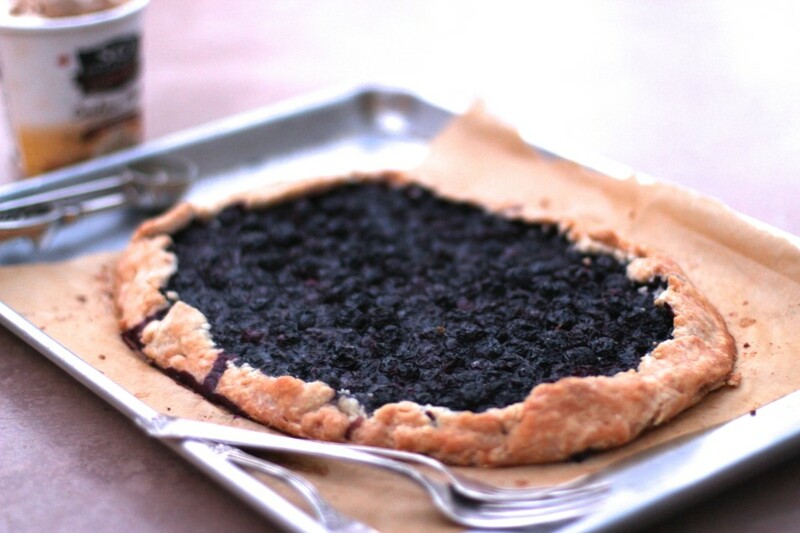 Please don’t let it stop you from making galettes (and pies) because the rewards are worth it. Even if you have never made a galette before you can do this! If you love fruit desserts give this galette a try before summers’ end you will be glad you did. And don’t forget the ice cream, lots of ice cream (hehe). Oh, and before I go I wanted to tell you about the little icon on my posts recently. It’s an app by a company called Chickory, it breaks down the recipe to give you a shopping list for the recipe. Kinda cool huh? I thought this may be helpful to you guys so I teamed up with them to make shopping easier. 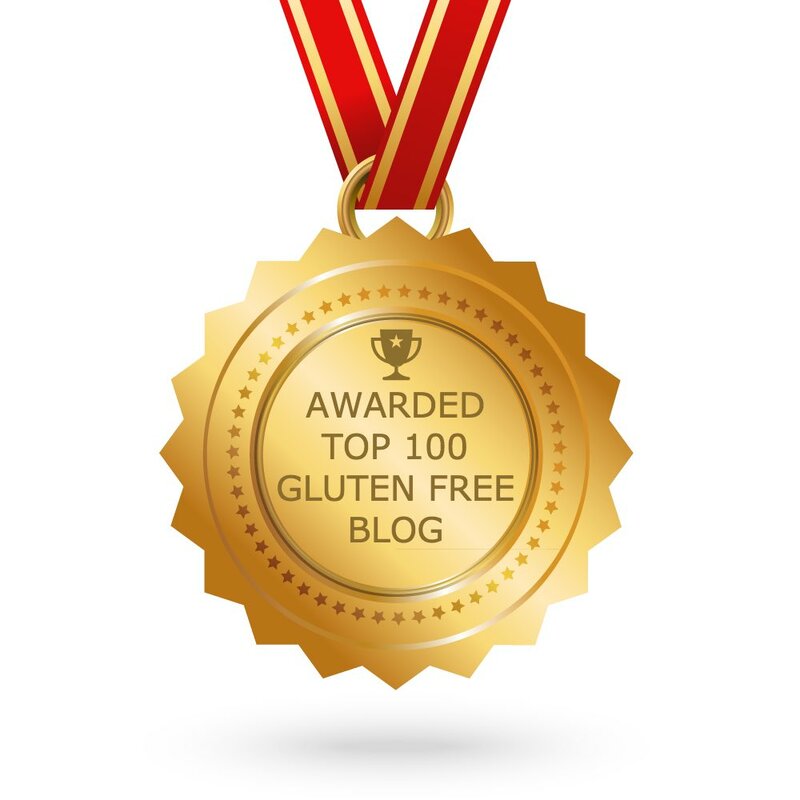 I did notice that if I’m not specific with the brand it will give a suggestion that may not be gluten-free, dairy-free, or soy-free or any other allergen food; so with that, if you are new to allergen free cooking please don’t hesitate to ask about brands suggested or check the ingredients – I am happy to help. 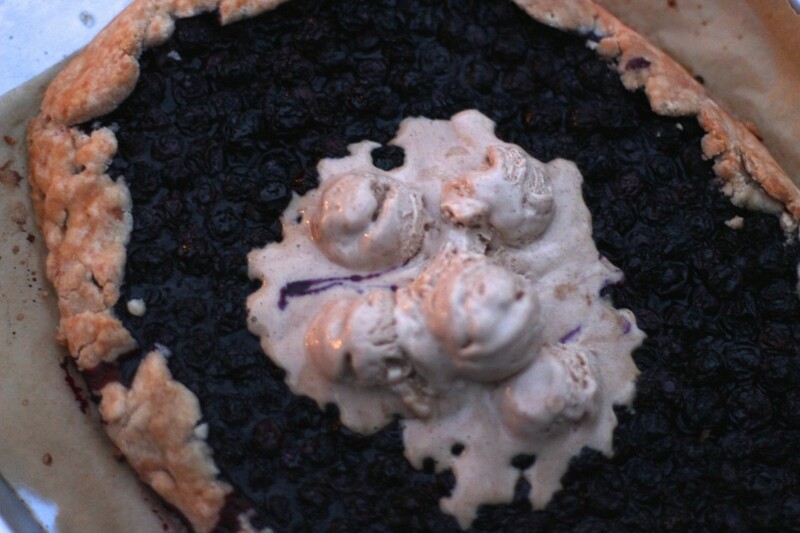 This blueberry galette is as easy as it is delicious, filled with sweet fresh blueberries in a slightly sweet crust and topped with snickerdoodle ice cream. 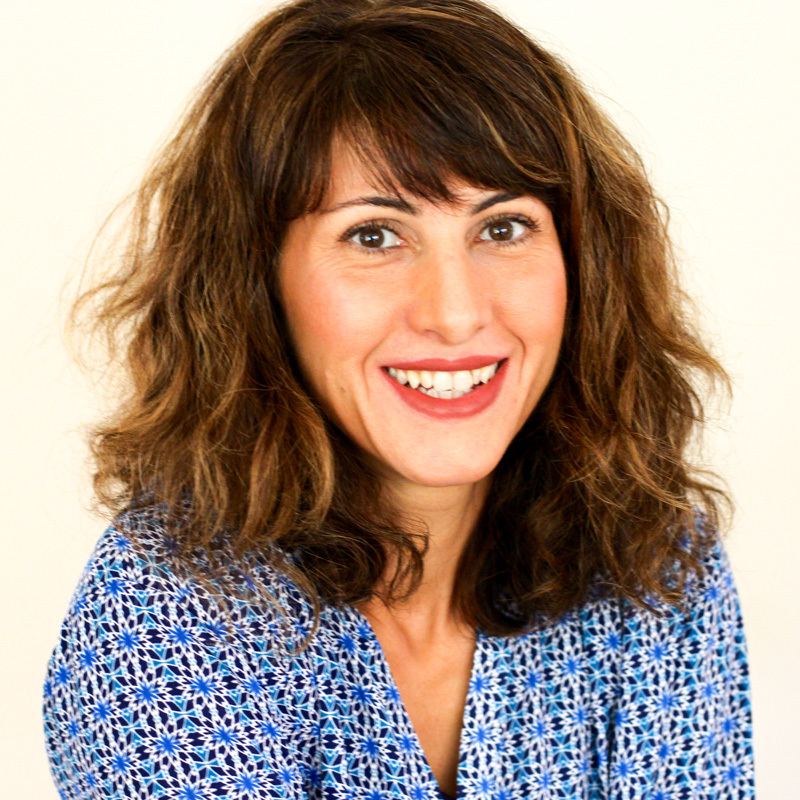 Gluten free, dairy free, egg free, soy free, refined sugar-free! Prepare the dough and chill (see my apple pie recipe for preparation). Preheat the oven to 425 degrees F (220 C). Prepare a baking sheet. 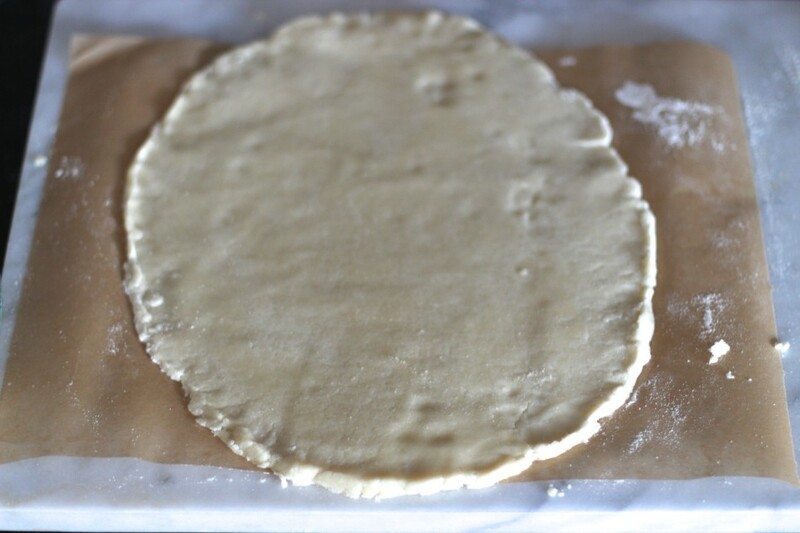 Lightly flour a sheet of parchment paper, roll out the dough into an oval (or round) about 14 inches long and 8 inches wide (give or take) and about ⅛ inch thick. Transfer to the baking sheet. 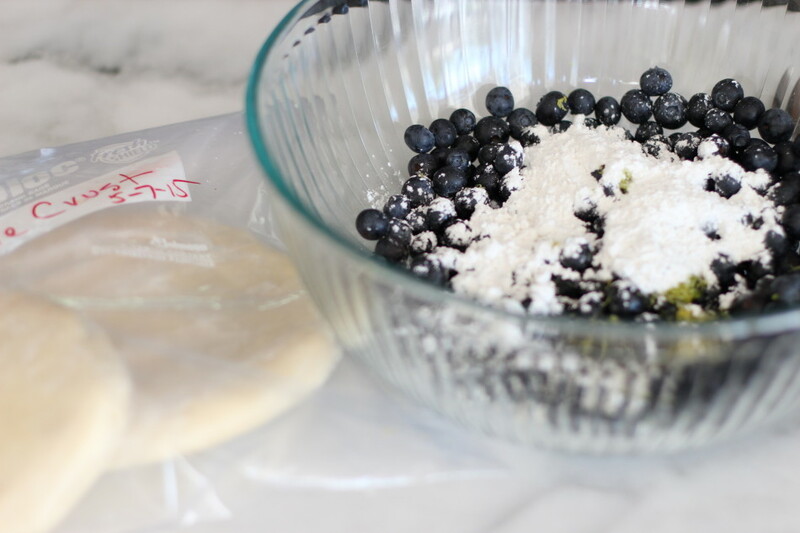 In a bowl, combine blueberries, lemon juice, sugar, and flour. Spoon the filling onto the dough, leaving a 2-inch border uncovered around the edge. Fold the edge up and over the filling, gently overlapping sections. Gently press to close any open cracks that may allow juice to seep through during baking. In a small bowl, combine coconut milk (or creamer) with coconut oil (or earth balance) and brush the border with mixture. Sway the brush (with wash) over any missed cracks if needed to prevent further handling of the dough (too much touching may warm the dough!) If you like, evenly sprinkle on the turbinado sugar. Bake until the filling is bubbling and the pastry edge is golden brown, 25-28 minutes. Let it cool 10 minutes before serving with scoops of ice cream on top. Given that I don't use egg as a wash it still comes out golden on the edges due to fat added to the "milk"; without it the crust will be pale and look raw. 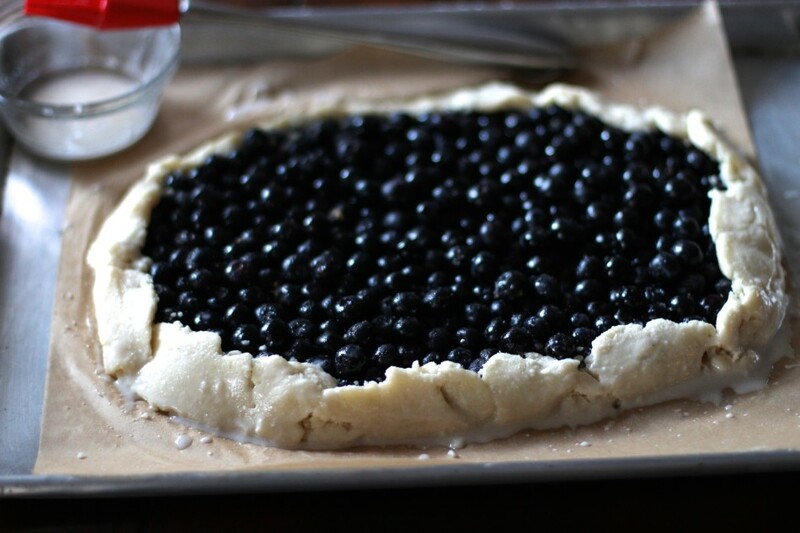 I chose not to add additional sugar to the crust to keep the sugar down since the berries were so sweet already. This is a very easy going dessert, it will work with just about any quick baking fruit. Strawberries, raspberries, figs, cherries, or blackberries would all be delicious and compliment the snickerdoodle ice cream flavor perfectly. I've never made galette before or pie. What do you suggest I used to roll out the dough? I don't have a rolling pin. This looks so good with the ice cream scoops on top! I tried the snickerdoodle flavor but just from the pint this takes it to a whole other level! Any vodka or wine bottles on hand? Those work well! Just make sure to wash them well before rolling. Hope you get to try this! Heck yes to ice cream on top! This looks heavenly Jessica! 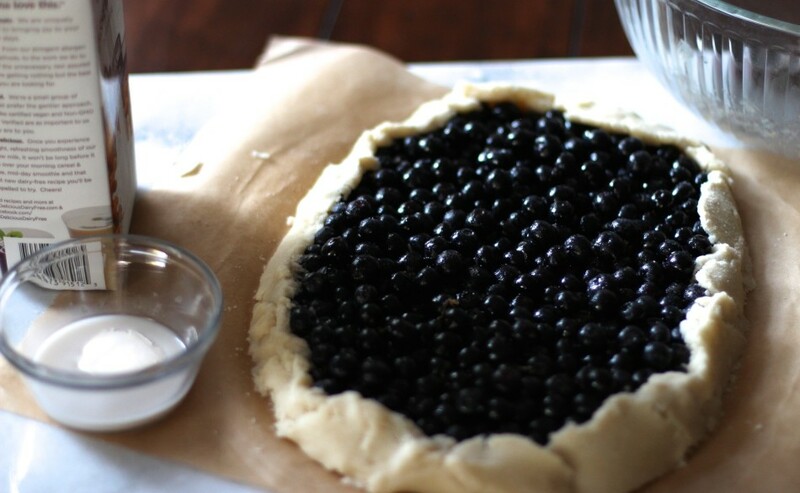 I have tons of blueberries that I don't know what to do with, thanks for sharing this it looks so yummy and easier than pie! YUM!! I did see the Bon Appetit cover and feel lucky to have this post in my inbox today :) Can't wait to try this! Aw, thanks Haven, you are so sweet :)Enjoy! I'm also curious about what to use instead of a rolling pin. This looks amazing with all that melty ice cream on top. Need to make this! Yes to fruit desserts! Blueberry is my favorite. 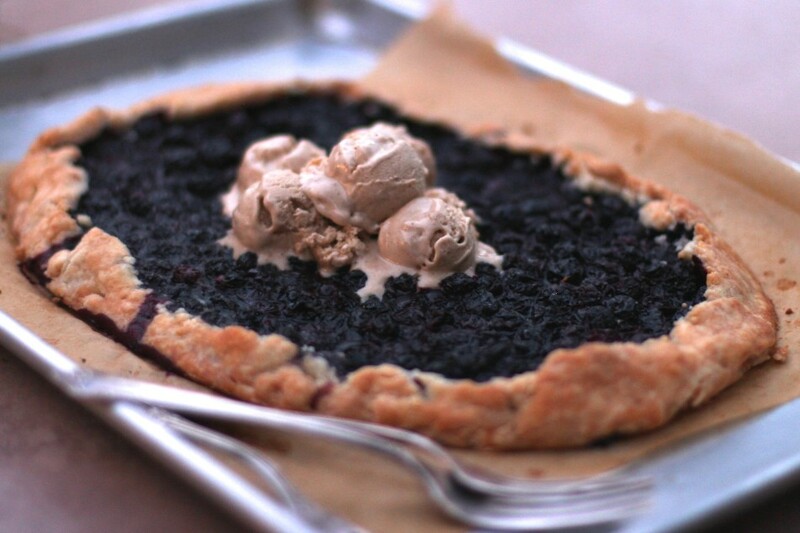 I love the idea of blueberry galette topped with ice cream. I will be looking for this brand and can't wait to bake this Saturday on my day off! Thanks Jessica! This looks delicious, any suggestions on making this sugar free? Thanks! This looks downright delicious! Will need to make this before summer is over. Galette is usually round, what inspired you to make it oval? I made this today for my sister visiting, she is vegan and I have celiac. I'm not much of a baker but my galette came out deeeelicious. I added turbinado sugar on the edges and plenty of snickerdoodle ice cream on top and wow! I needed 3 more minutes of baking, other than that recipe was on point. Thanks for the recipe! Yay!! Thank you for sharing Jackie...bet you're sister wants to visit a lot more often now lol! This galette was a hit last night, I brought it over to my brother's dinner party and topped it with vanilla ice cream as you suggested. I made it once before just to make sure it would be good enough to share. :) I'm celiac but no one else is and they all thought it tasted like it had gluten and dairy and loved it! My only question is how long can I freeze the second pie crust? I like the ideaof making it with strawberries next. Yay, happy to hear it was a hit! Well sealed, it can stay in the freezer up to three months. Strawberries would be deeelicious, let me know how it turns out!